Want To Easily Rank for ALL Your Local Towns & Double Your Website Sales? Easily build trust and social proof and rank for every city you serve with our super-optimized & expandable local portfolio of your projects, testimonials, reviews & references. Local rankings simply get stronger as content is added! Easily generate valuable reviews, testimonials & feedback, intercept negative reviews, & boost rankings by prompting happy customers to easily leave great reviews for you on reviews websites about 90% of potential customers reference! Easily, automatically & reversibly optimize your site / future content with powerful best practices - it can work with other SEO work and/or Yoast, too! Download the Free Plugin & Add It to Your Site to Get GREAT Rankings! Big directories like Yelp, YellowPages & Angieslist rank in lots of cities because their content is organized into an optimized directory page for each city with strong internal linking. This plugin levels the playing field for small businesses, as it can automatically do the same for your site in the area you serve with your portfolio, projects, clients & testimonials as your expertly & automatically search engine optimized local content in a convenience-adding/value-adding and useful locally browseable hierarchy that lets website users find nearby customers of yours for a reference. Premium versions also contain a portfolio auto-optimizer technology to help you get the most traffic out of that cotntent as well. Just install the plugin, set your key phrase, location and service radius, add portfolio items, and you can start watching for the earned traffic to start quickly flooding in! It's even designed to also help improve your rankings in "map-pack" listings after Google's Pigeon update gave much more weighting to organic signals, and as your business grows, your portfolio can easily grow and expand with your service area and your business. You can also use it as an easily-sortable traditional portfolio as well. The Reputation Builder included in premium versions is a great way to request feedback and generate great & authentic online reviews, and is built into the plugin. The system allows you to request testimonials and / or prompt reviews from customers on a landing page on your site. You can mail customers individually or en masse to leave you feedback, or even set up a feedback kiosk in your store. You can then moderate their review and testimonial for publishing on your site, and if their review score is above a threshold that you define (ie 4 stars or higher), after submitting their review / testimonial on your site, you can automatically prompt them to review your business on other reviews sites you have specified like Google, Yelp & more, with easy-to-click links to your profiles for them to quickly review you there! This helps you generate authentic, positive reviews online and increases your credibility with Google and other sites. Surveys have shown having such reviews to be another way to rank higher in Google as well. If the customers rating of their experience is below your goal rating, you'll have a chance to know it and reach out to them before they leave a bad rating for you online somewhere. Online reviews have also repeatedly been shown by studies to be a huge factor in what businesses consumers choose to work with. With our Reputation Builder, you'll be able to not only improve your business with feedback, but also help generate the online social proof that potential customers are looking for. You can also use the system as a site's main portfolio that is designed to be sortable service provided and industry and even extensible and themeable using Wordpress' built-in template hierarchy and taxonomy systems. The system is thoroughly extendable so Wordpress developers and designers can easily integrate it into their existing workflows, and it can also work with Advanced Custom Fields on its localproject post type. Already have a portfolio? You can use a plugin to switch its post type to localproject, and then merge your portfolio into this plugin (probably with a small amount theme adjusting required as well). Integrating Schema code into your website helps search engines to know your company's location so it can be shown in map results. Our plugin gives you the ability to easily add that kind of code to your website with information like your address, phone number, company description, and book, reserve and menu actions to help your business show up well on maps for searches and on the local business information cards of information used by search engines for local searches. Our plugin gives you the ability to easily add that kind of code to your website with information like your address, phone number, company description, and book, reserve and menu actions to help your business show up well on maps for searches and on the local business information cards of information used by search engines for local searches. 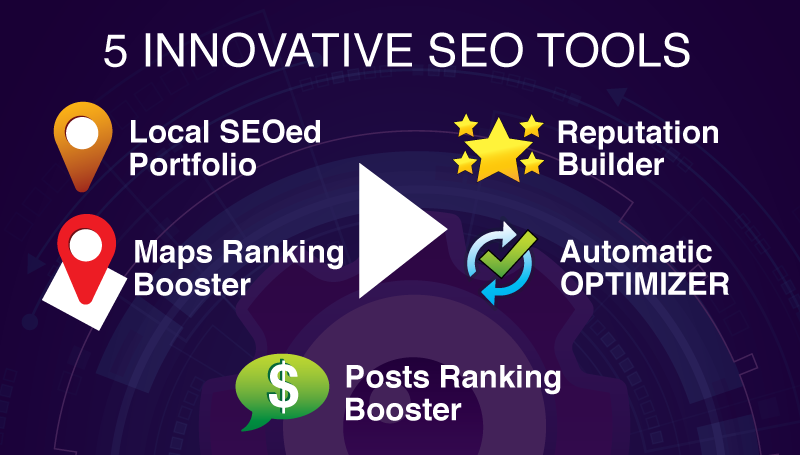 Leveraging artificial intelligence and twelve years of professional SEO experience for small businesses, the plugin is designed to implement SEO best practices with just a few settings switch flips. Things like title tag adjusting & image alt tagging are automatically taken care of for all your posts/pages and future posts/pages. The optimizer can also provide content topic suggestions, keyword suggestions for working into pages, and simple instructions to help you optimize your site even better. The optimizer also works well with Yoast and what optimization you may already have done on your site. If you prefer to not use the automatic optimizer, you can just choose to not turn on those options. Like many have been raving about, sculpting your site's pagerank is a great way to increase the traffic to your blog or shopping cart by doing a better job of letting your users and Google know what content on your site is the most interesting / important. Our FREE Blog Booster & Ecommerce Booster widgets automatically track your best posts from an SEO traffic / lead generation / sales generation / profit generation performance standpoint and features them in a popular / featured posts and/or products widget and in a special archive ordered by their SEO traffic popularity. This not only lets users easily see what is the top content on your site, but also directs more "link juice" to your most important content, thus drives up the pagerank of that content, and thus helps that most important content to rank higher. Traditional SEO services have two problems. 1) The service is usually a point-in-time optimization where future content and blog posts are not optimized at all, and 2) business owners are ill-equiped to satisfy Google's mantra of "make great content". Your typical plumber probably isn't going to write a viral article on plumbing and rank #1 for the term "plumber", but he can showcase the plumbing work he did for a certain city, and have that content then optimized in our system to rank him for "plumber x 'that city'". If he does do a blog post on drain repair, again, it's not going to rank for like anything by default, but with the automatic optimizer turned on, that post can be automatically optimized to rank for "drain repair 'that city" without the plumber having to try to read volumes of SEO books. That's the beauty of our system -- SEOs can create a stronger value for their customers by also giving them a SEO system that the client can grow while helping their clients to build trust with their prospective customers at the same time! You can click to download the free plugin below, and easily order premium features upgrades (enabled with a software subscription key in the plugin) as you need/want them. Don't have a Wordpress site? You can easily make a Wordpress-based portfolio site online for like $5/month at most web hosts, link to it from your main site's home page, and then use the plugin on that site / domain. For tips on how this works best and what else you can do, you can check out our tips section here. So what are you waiting for? Please give it a try today! You can download our white-labeled version from our download page on this site, charge clients whatever you prefer, and refer them to ProLocalSEOTools.com for product information. Our white-label version removes the Best Local SEO Tools branding and moves the settings to the bottom, so you can stay more fully in control of your client's experience. As clients need new keys or upgrades, you can just purchase them at BestLocalSEOTools.com and put them into the plugin to make it work and bill them what you like. As an affiliate, you can also get like a 50% commission on your reseller key orders with us and get a listing in our local implementers directory as well! You Can Get It Today! The free version includes the powerful local portfolio, the basic reputation builder, the basic maps boosters, a home-page optimizer and the basic posts ranking booster for proving the plugin works. Results are usually visible in a week!